Hi and welcome to this blog post in February! Wedding. Yes, I was so fascinated by that Engagement Shot in November that I want to learn more about it. I don’t know if it will be successful, but I plan to be part of Weddings as a second shooter. Finally, that summer I will cover the wedding of my friends Timo and Jessica near Hamburg, DE. That will be fantastic. I am VERY excited and you will be able to read about the whole job here in my blog. Nature. Of course, nature again this year because of the spectacular Ospreys at the reservoir. This time I will shoot them from the middle of the lake using strobes in a decent way. That means to expand much effort because of the whole strobe arrangement, the boat, the permissions etc., but I am sure it will be worth it get outstanding images. Cars. The continuation of my commercial-like car shoots. In spring I will shoot a Nissan Skyline, for example. There will be several more cars, but this one will be a more prominent one. That means to find a cool location that underlines the character of the car and creates a special mood. Smartphone Camera. This will be fun. I want to know if it’s possible to take (more or less) professional photos with a smartphone camera and the built in or an external flash. I just want to show how you can take better images with your smartphone camera. Sports. Yeah, sports will be also a topic of 2012. I will shoot some more “exotic” sports this year and tell you something about the light arrangement etc. Well, that’s all for the moment. I don’t know how the order of the topics will be – we will see. I hope you will find a topic that you are interested in. I am sure there will be more topics for 2012, but those are the big ones. Hi and welcome to this blog post! 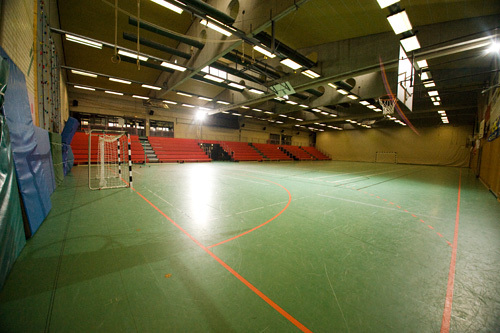 Today’s topic is about how to shoot indoor sports to get high-quality photos. Sometimes gyms do not offer the light quality that you need to create high-quality photos. So, you need to bring your own light. It’s no secret that professional sports photographers use strobes to light gyms or arenas. Thanks to Dave Black I learned a lot about that and this weekend I did it the same way. This weekend’s venue was the GSH Alsfeld, which is one of that dark venues with horrible light. It’s one of the darkest gyms that were ever built. Here one has to shoot with ISO 10000 and f2.8 to get a shutter speed of 1/320s! Every photographer gets nightmares when have to cover games that are hold in this gym. The results are mostly not that good – technically – because of the very lame light. And every Monday one can see the grainy, dull and blurry results in the sports section of the local newspapers. Not only bad for the reader but also not that good for the image of a newspaper. Because I’m not satisfied with such lame photos, I did it the professional way. While some photographers already brought their own light to dark gyms, they made a mistake by using on-camera flash. There is no worst idea like shooting indoor sports with an on-camera flash because on one hand it disturbs the athletes and on the other hand it offers no good light in terms of a natural look – as direct flash does mostly. That leads me to point #1: Don’t use on-camera flash but off-camera flash. Professionals are using off-camera flash in terms of sport strobes that are mounted high above the court under the ceiling to illuminate it like lamps do to create a natural light look. 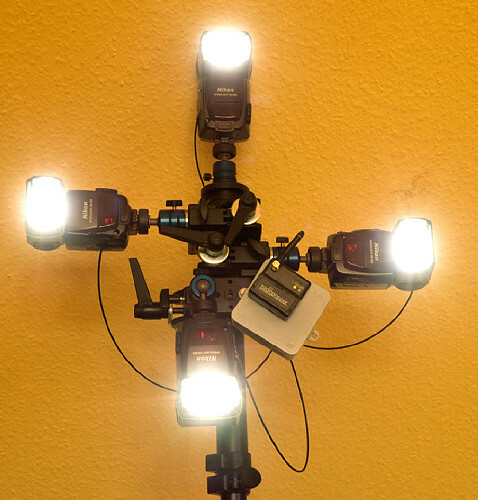 Okay, that’s #2: Mount your flashguns/strobes under the ceiling. It’s a pity that we don’t have such nice catwalks under the ceiling like they have in the USA. That makes it way more difficult to get the lights up there. If there are no catwalks and no ladders that would it make possible to reach the ceiling you have to find another way. Maybe you rent a long ladder from a hardware store or you rent a manlift etc. But the very first step you should do is: Ask for permission! Ask the teams, ask the housekeeper and everyone else who is involved in decision making. Also make a contract to play it safe. Apropos “safe”: Safety comes first! Secure your installations and make sure that if something brakes no one gets hit. As you can see you have to arrange a lot in the first place before you are able to mount your lights. 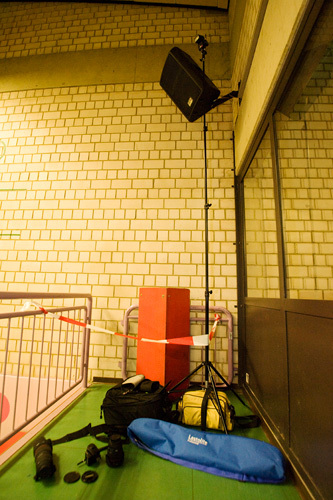 Maybe that’s the thing why in Germany there are just a few photographers using sport strobes. Effort is a big obstacle in an age where time is more money than ever. Anyway, I made all that arrangements before and on Saturday I was ready to install the lights under the ceiling. I made all the installations early that day and went there at 10 o’clock in the morning. The first game was at 4.30 p. m.
As always I made a plan. Finally, I installed one flash in the upper left corner and another one in the lower middle. During the game I positioned myself in the lower left corner. That’s the typical light setup that causes a fill flash and a backlight. As strobes I used only two NIKON SB-800 Speedlights. The benefits are that they are light and portable and don’t need an external power supply. As Dave Black says in his workshop videos, the Speedlights have plenty of power and due to FP sync very short shutter speeds are possible. That means I can freeze all the action and can blend the available light with the flash light so that no ghosting appears like it would be with the typical sport strobes. Because the SB-800 just sends the infrared signal up to 20 meters and a line of sight is needed, I used the RadioPopper wireless triggers. They allow me to trigger the Speedlights without a line of sight and from a distance of 400+ meters. Finally, the difference between available light shots and flash light shots are amazing! Thank’s to the very clean high ISO of the D3, I can use ISO 5000 to realize a shutter speed of 1/640s which is okay for Basketball. The flash light cleans the high ISO and the result is a clean photo with a good contrast, saturation, more detail and frozen action. As you can see, it’s worth the effort to make all these arrangements and installations. As for my part I use flash whenever it is possible. Hi and welcome to this post about shooting Motocross in a professional way. As you know, I’m working on a sports project this year. I started with swimming in March and proceeded to motocross in April, then to track and field in May and in fall/winter I will shoot volleyball and other indoor sports. 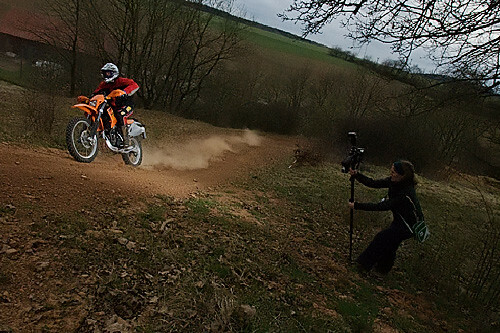 Today I want to show you a professional way to shoot motocross scenes. Mostly the problem of shooting motocross is a blown out sky and black faces caused by long shutter speeds to reveal the rider from shadow caused by backlight. Also if you shoot with the light you have often these problems. Available light shots often don’t offer the possibility to shoot with high shutter speeds to freeze the action so that especially the wheels of the motorcycle show motion blur. You will need at least a shutter speed around 1/2500s to freeze the motion. But when there is not enough available light you have to reduce the shutter speed and that results in a blown out sky and motion blur. 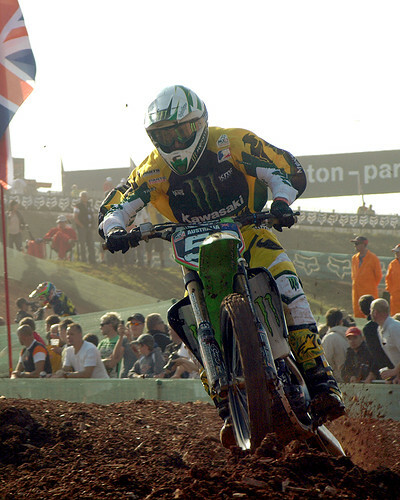 Finally, the typical available motocross image looks like the following. As a perfectionist I have a professional approach. That means that I want great images that contrast from competitors. So, I have to think about a solution to get better images than the other photographers. In the case of motocross images I have to solve the blown out sky problem, the contrast problem and the dark face problem plus the motion blur problem. All these problems have one basis: LIGHT. If light causes these problems, it will also solve them. The point is that I just have to use it for my purposes. I cannot adjust the sun and I cannot blind the riders by using a reflector – so, I need my own adjustable light – FLASHLIGHT. I know that there are photographers out there who are using flash for sports coverage no more because they got more kicks than half-pence when they used flash. Just because they weren’t able to use it in the right way. Maybe they shot straight away with an on camera flash at full power, disturbing and blinding athletes don’t knowing that there is the ability to use iTTL and off-camera flash. What a pity! Maybe they blew down athletes and therefore got beef. Finally, it’s no surprise that indoor sports are shot with ultra high ISO that causes grainy sports images and bad contrast and color. So, it’s also important to know technical details about photography. As a “Nikonian” I’m using the NIKON SB-800 flashgun. Here I can use FP-Sync to get shutter speeds up to 1/8000s. That enables me to blend available light and flash light also at daytime. A fast sync speed takes more power so I need much more flashes. I tried four NIKON SB-800 Speedlights. Another advantage is that because I can effectively blend available light and flash light I don’t disturb or blind the athletes. That’s because I don’t need that giant flash that makes the flash light the primary light. Typical flash solutions have a maximum sync speed of 1/250s so they must be brighter than the ambient light to prevent blurring. But with FP-Sync I don’t have that requirement. Of course, it’s that easy! Because motocross is not static I need a portable solution. So, let’s see what’s possible. Building a portable flash solution that offers enough flash power isn’t a problem. There are already solutions on the market. As I already said, I’m using the NIKON SB-800 Speedlight. The great thing about it is that they have plenty of power plus the NIKON Creative Lighting System (CLS). It allows you to combine as many flashes as you want and adjust their power output separately and control and trigger them wirelessly. I trigger the Speedlights via the NIKON SU-800 Commander wirelessly over a distance of 20 meters. To get a greater distance I’m using the RadioPopper PX System. With this solution I can trigger the Speedlights from more than 400 meters away. The RadioPopper transmitter converts the infrared signal from the SU-800 to a radio signal and the RadioPopper receiver converts this radio signal back to an infrared signal for the SB-800. For my portable flash solution I’m using four Speedlights and put them on SuperClamps which I mounted on a Monopod. To trigger all SB-800s I’m using one RadioPopper receiver. It’s connectet with the Speedlights via a black box and optic fibre cable. On location my assistant controls the light by adjusting the DIY Quadlight into the right direction and following the motorcycle. Using flash solves all the problems named above. Thanks to FP-Sync I can use 1/2500s to freeze the action. I also have enough light to reveal the rider from backlight and shadow. And my images are rich in contrast without post processing.